At least one thousand Hawaiians lived and worked in California in the mid-nineteenth century. As itinerant seamen and fur hunters they touched Alta and Baja California shores; as cowhide skinners, sea otter scalpers, agriculturalists and Catholic converts, they lived and worked in the Channel Islands and in Mexican ranching towns; as stevedores, boatmen, and day laborers they peopled the port city of Yerba Buena; and, during and after the Gold Rush, as miners, fishermen, boardinghouse keepers, opium farmers, factory workers, beggars, and vagabonds, they lived amongst others in Sacramento, San Francisco, and in the Central Valley. In the course of research at the Huntington Library, the California Historical Society, the Bancroft Library, and throughout Hawaiʻi, I have uncovered a multitude of stories of Native Hawaiian migrant workers in nineteenth-century California. In this talk, I will discuss Hawaiian migrants to California and their experiences of life and labor in early San Francisco, from the city’s sleepy beginnings as Yerba Buena in the 1830s and 1840s to the aftermath of the Gold Rush in the 1860s and 1870s. During this era, Hawaiians were a crucial part of San Francisco’s story of cosmopolitan growth and urban transformation. Kieth Hansen has been hooked on birds since he was a kid, when his brother ran into to grab him, and showed him a Cedar Waxwing in the woods of Maryland. Not long after, his family moved to Fresno, where the Sierra Nevada became his backyard, and he went deep into birding, and on to do a 3 week stint on the Farallones with PRBO in 1974 as the youngest person to be allowed on the islands. Since then his birding has taken him all over the world. He also came from an artistic family, and those two interests were have been tied together since his senior year of high school. His first book was a coloring book about birds of the Sierra, followed by a 4 year project to produce illustrations for “Discovering Sierra Birds” co-authored by my Ted Beedy and Steve Granholm. Originally it was planned as one book, but the field guide + life history became too much. The life history book has been published first with example images from the field guide illustrations. To paint one illustration takes about 2 months from a blank canvas, a slow process of building up the picture of the bird, starting with pencil, measuring out and couting the feathers; wetting the bird and starting with a neutral tint for shadow, then adding color, sheer washes over each other, drawing more while the paint drys, then back to paint; paying attention to the translucency of feathers as they overlap; the full colored bird building up slowly but surely; the final touches in place with colored pencil. A lot of these images are made up, not directly from a photo or illustration, but trying to get the bird in the perfect pose: pulling from his own years of observation, videos he has taken, specimens, other books, and photos. Consulting with his many birding friends and experts in the birding world to make sure he has gotten it right. This is his 13th book, and for the most part he can block birds out without too much work, it’s the details that take the time and effort. Although he enjoys it, he does not draw as much as he would like in the field. His love of birds is clear from the beauty of his final exquisite images, and he takes inspiration from his trips out in the field (he showed a great video of birds in the Sierra’s) and also in his backyard in Bolinas. His studio has proved itself an excellent little observatory as well. His images are fairly small — but this is mostly a factor that he has had to draw so many, and that they will actually be even smaller in the book. He has been pleased to see how well they can be blown up though. One of the most important factors in getting the birds right is their weight and center of gravity — how they carry themselves, and their relation of their legs to the body. We still illustrate bird guides he says, because they can be drawn in a neutral space, the same generic conditions and lighting to make them easier to compare, and it is easier to highlight and show features. A photo guide has the disadvantage of having a background and the varied lighting, and varied conditions. With an illustration it is easier to show the details and variations that matter. 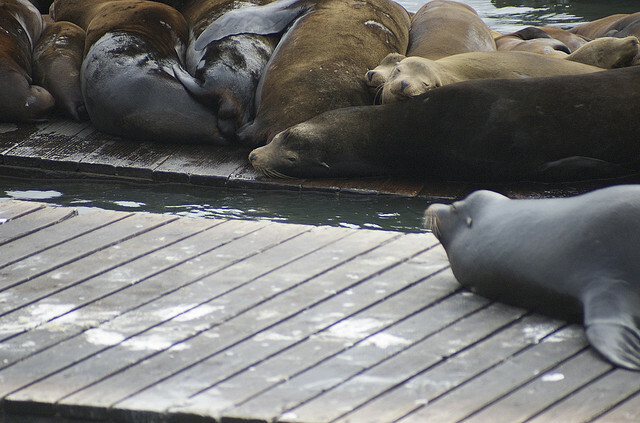 The Marine Mammal Center has been rescuing and rehabilitating marine mammals in northern California for 40 years. In addition to rescue and rehabilitation, The Marine Mammal Center conducts cutting edge science research through collaborations all over the world. The Center was the first to discover domoic acid in California sea lions and continues to research why cancer is so prevalent in this sentinel species. Lauren Rust, a research biologist with the Center, will go more in-depth about the extensive research projects at the Center and how this research is being applied to the current sea lion crisis. Lauren Rust has been in the marine mammal field for over 12 years on both coasts. She’s currently a research biologist at The Marine Mammal Center in Sausalito. Lauren manages the research department which involves conducting necropsies (animal autopsies) on patients that die at the center as well as large whales on the beach, collaborating with researchers nationwide and helping the veterinary staff care for the sick and injured animals waiting for release. She hails from South Carolina but moved to the Bay area with her family 5 years ago.